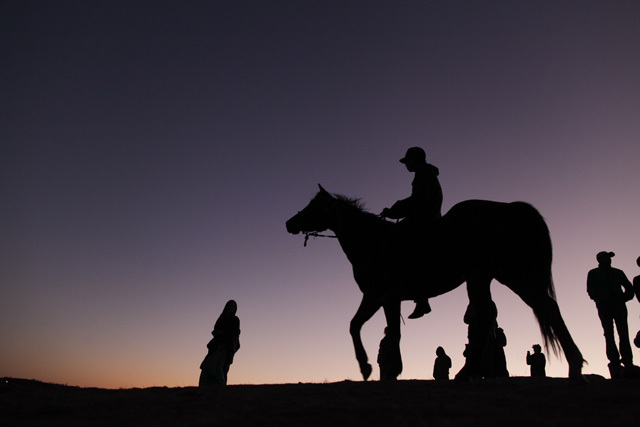 A photo essay from Standing Rock, where indigenous activists pray and prepare for winter, even as police brutality mounts. 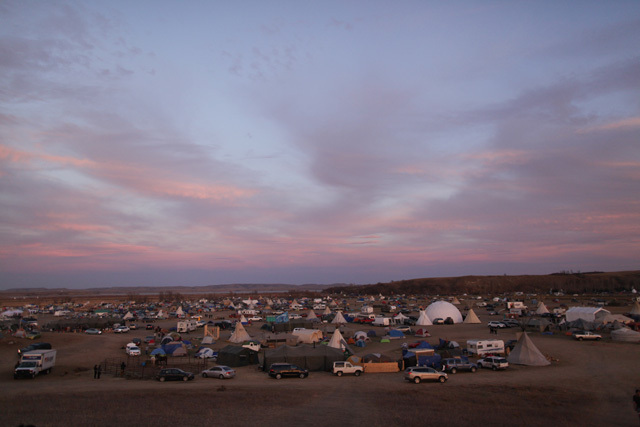 Coming over the hill on Highway 1806 in late October, the sprawling Standing Rock encampment surged into view. Tipis, tents, and a geodesic dome dotted the valley below. 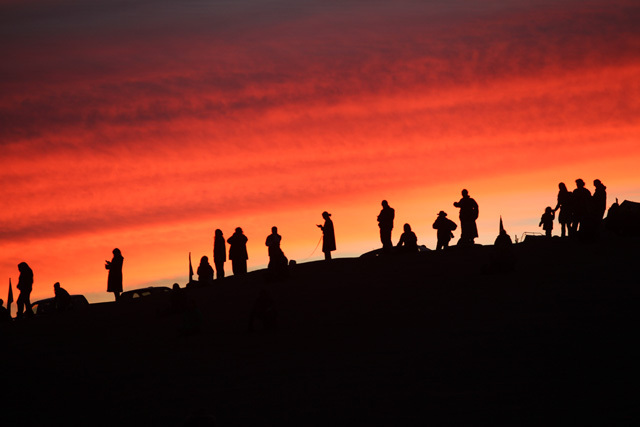 Nestled along the Cannon Ball and Missouri Rivers in remote North Dakota, the Oceti Sakowin camp had recently grown to over 7,000 people. 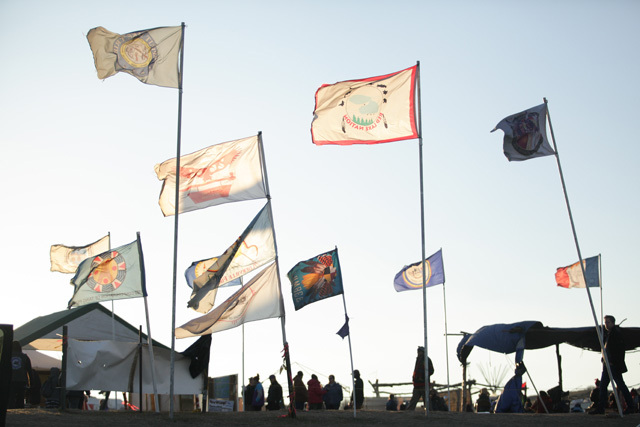 Those camped there have led a months-long effort to resist the construction of the Dakota Access Pipeline. The 1,170-mile pipeline is slated to transport crude oil from the Bakken shale fields of North Dakota, through Standing Rock Sioux treaty land, under the Missouri River, and on to Illinois. 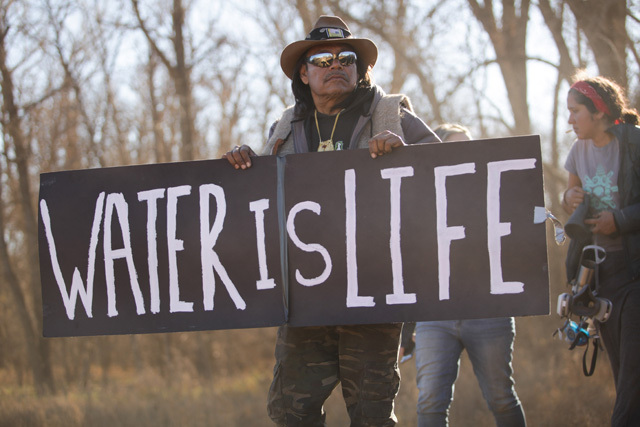 The Standing Rock “water protectors,” however, fear that the pipeline will poison the river and with it, the water supply not only for the Standing Rock Sioux but the millions of others who live downstream. And so they pray and march and refuse to move. 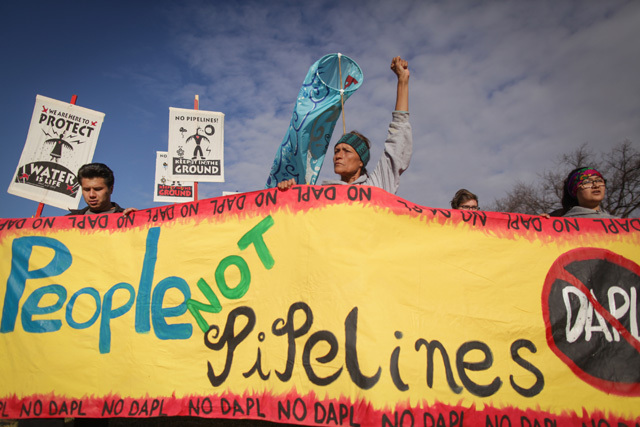 So far, their efforts have managed to halt the pipeline’s advance at the west bank of the Missouri pending a final permit from the Army Corps of Engineers. 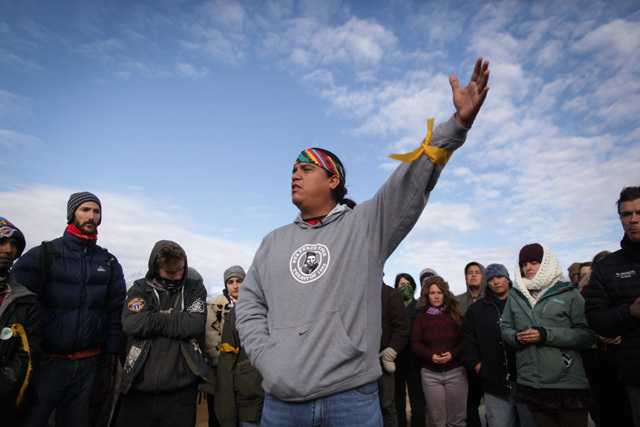 By the time I arrived, the Oceti Sakowin camp had been inundated by supporters from across the country: from the environmental movement, Black Lives Matter, the progressive media, and elsewhere. Yet the Standing Rock struggle remains an indigenous-led one, an historic coming together of first nations. 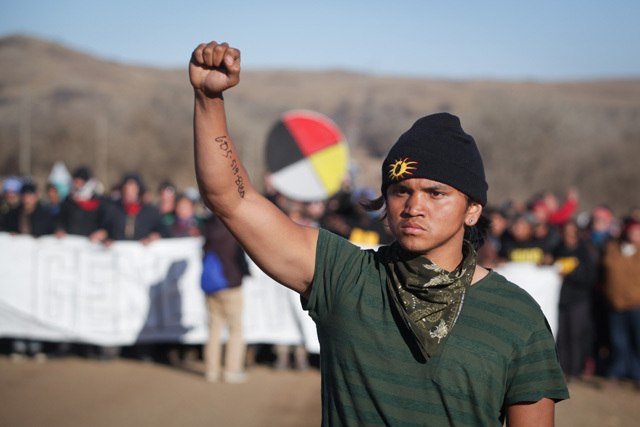 It’s the first time the seven bands of the Great Sioux Nation have united since Custer was defeated 140 years ago, and with more than 300 nations standing in official solidarity with the movement, it is by far the largest mobilization of indigenous peoples in the United States in a generation or more. As we drove up to the front gate, the security team that waved us through was a mix of old-timers with American Indian Movement logos safety-pinned to their leather coats and the next generation of indigenous youth from Standing Rock. 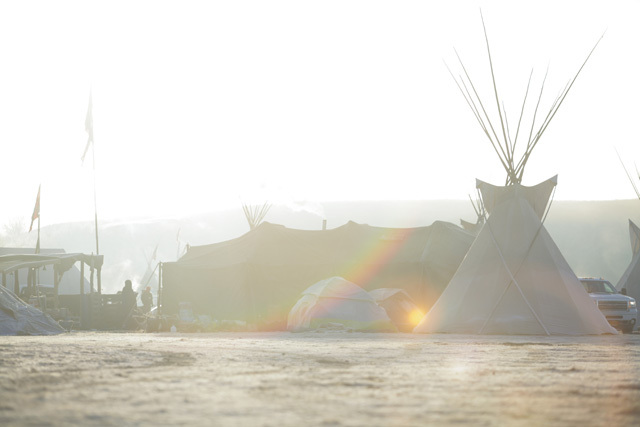 Every morning at Standing Rock: "It’s time to get up. This is not a vacation. We’ve got work to do, relatives." The 10 days I was at the camp, which included the presidential election, were a period of relative calm, as the pictures in the accompanying photo essay suggest. The Army Corps of Engineers was set to announce a major decision on whether to grant an easement to allow Energy Transfer Partners to drill below the Missouri river, and the indigenous leadership wanted to keep prayer-based actions outside of camp to a minimum pending the decision. This was also a time of prayer and ceremony, which people at camp described as part of an essential process of personal and collective healing, helping them to stay strong in the face of the long struggle ahead. Even the marches and demonstrations were always peaceful and prayer-inflected. This period of relative tranquility, however, was broken this past Sunday as police from the Morton County Sheriff’s Department confronted some 400 water protectors on Backwater Bridge just north of camp. 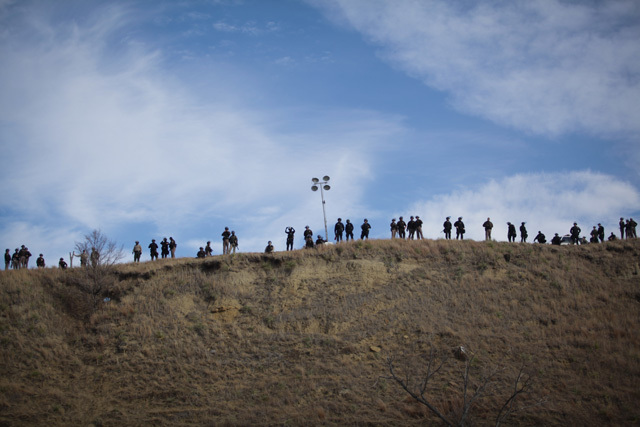 According to a report from Dallas Goldtooth, an organizer with the Indigenous Environmental Network, the protectors were attempting peacefully to move a burned-out truck off the bridge and clear access to the public roadway when police trapped them on the bridge and opened fire with tear gas, rubber bullets, mace canisters, and concussion grenades. Jerky video from the scene shot by witness Kevin Gilbertt shows the police blasting water cannons into the crowd in sub-freezing temperatures. 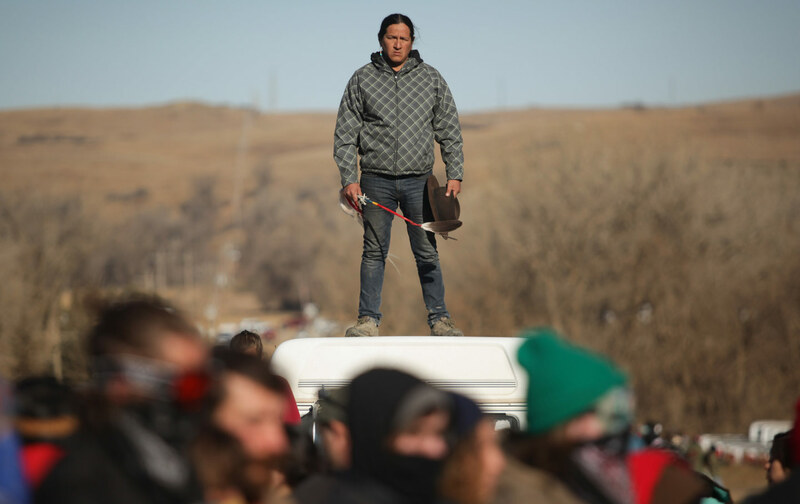 People lost consciousness and dropped to the ground as the freezing water hit; an elder went into cardiac arrest and was revived on site by medics, according to a press release issued by the Standing Rock Medic and Healer Council. It also reports that at least 300 people were injured, with 26 people requiring immediate hospitalization. One of them, Sophia Walinsky, is facing amputation after a concussion grenade reportedly exploded on her left arm. While this level of brutality and violence against peaceful demonstrators is clearly extreme, it was not the first time the water protectors have been met by blunt force and intimidation. Nor is it likely to be the last. 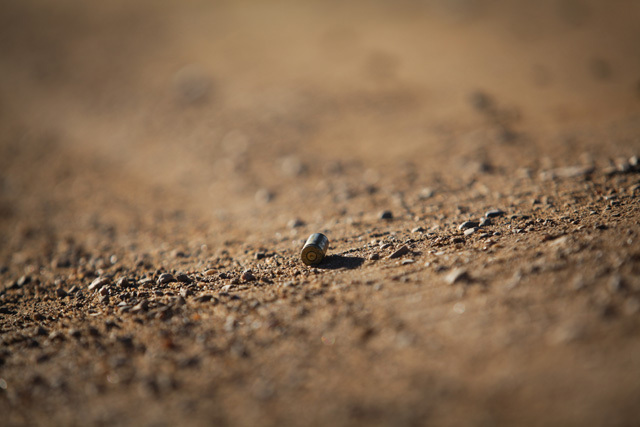 Native peoples in this country have faced every tool the US government has to displace, dispossess, and destroy them for more than 500 years. Yet as the winter comes, the water protectors are not giving up. 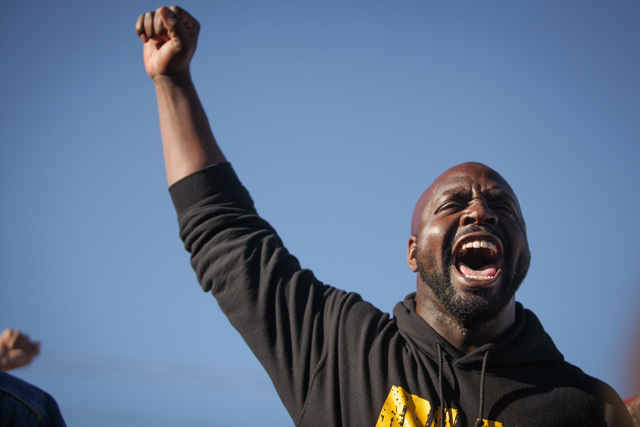 Their movement is part of a long history of struggle. And regardless of what brutal force it faces, it isn’t going away. Jake RatnerJake Ratner is a freelance photographer, videographer, and movement media maker whose work has appeared in The Nation, Salon, Common Dreams, Truthout, and other publications.